Containing "MacHamlet", "Bard Again!" 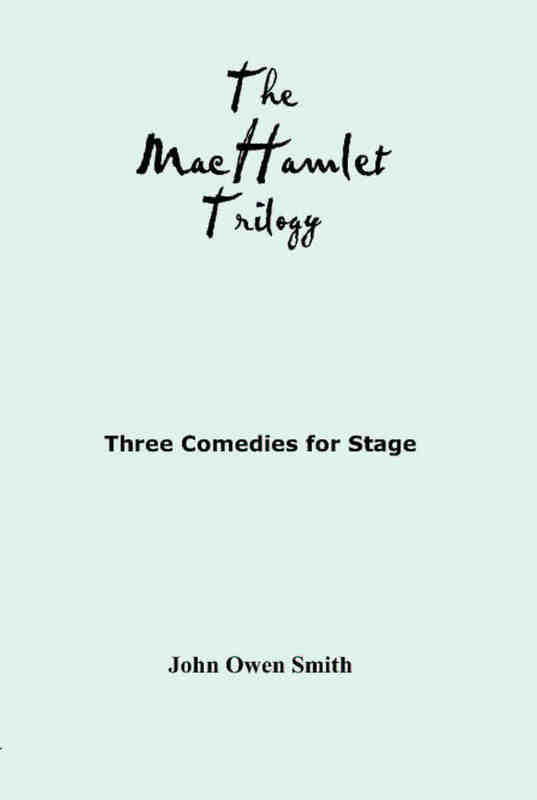 and "MacHamlet Goes West"
RRP: : £7.95  Royalties also to be paid if the plays are performed. I had already written twelve pantomime scripts, and was being asked for more. But to be fair, there are only so many variations on a traditional pantomime theme that one can write. The ending to Shakespeare's Hamlet had always seemed to me to contain a certain element of pantomime ('He's behind you!') and the urge to build on this became irresistible, despite dire warnings from illustrious sources. And what better combination than to mix it with the play that dare not speak its name? In the MacHamlet series, the characters from the Bard's plays put aside their local differences for a while to face a common foe. And the three Witches add a fourth dimension to the plots. What happens when you mix the characters of Macbeth and Hamlet together in a game of medieval football? These three plays are designed to be performed as an entertainment at a medieval banquet, with audience participation. The trilogy follows the adventures of our heroes as they get involved in yet more convoluted situations plotted by the three time-travelling witches. You don't need to know your Shakespeare to enjoy these comedies, but those familiar with the Bard's works will sense some subtleties below the plotlines. These plays were designed to be performed as an entertainment at a medieval banquet. As such they do not require complex scenery or lighting, any more than Shakespeare himself did. In production, we inserted an extra interval in Act I to enable the first course to be served, with a second course served during the 'official' interval between Acts I and II. Put in local variations as you wish, and if you think you can improve on the quotes then do that too! Good luck with your show, and please have fun. The musical bottles in Act II Scene 2 were achieved by part-filling with liquid to obtain a scale. You will note that there are seven Danes and we found (surprisingly) that small Carlsberg bottles could be tuned to give seven notes of the tonic sol-fa scale. Each bottle was numbered, and the cast rearranged themselves in line so that they got it wrong twice, then correct the third time. With the Scotch whisky bottles on the bar, we found that a range of empty bottles of various brands gave us most of our scale (we needed to part-fill just one of them)  and we used a wine glass for our top note. As a historical fact, Lady Godiva was a contemporary of Macbeth, though I'm not suggesting they ever met in real life  and certainly not at a football. The 'football' match in Act II Sc 5 became more of a handball match due to constraints of the number of tables, chairs and diners in the auditorium. But frankly, by that time nobody cared! And if you need help in constructing a Lego trophy, ask your children!! We gave each table a bag of Lego bricks during the interval asking them to construct a suitable trophy to replace the one broken by Macbeth earlier. Results were collected by the Witches in Act II Scene 6. The 'football' match became Water Polo and Beach Volleyball respectively, but the chaos and mayhem remained the same! PS. I'm very happy for you to video your production  in fact I would recommend it. We have found that to show an early dress rehearsal to cast and crew in place of a straight rehearsal can be time well spent. The main 19 characters remain the same throughout the trilogy, with three or four different additions in each of the plays. See MacHamlet, Bard Again! and MacHamlet Goes West for details of cast and scenes in each.